Discussion in 'Baja Mexico Fishing Reports and Discussion' started by Rancho Leonero, Jul 16, 2017. Conditions remained excellent for fishing – hot days with light midday breezes helping cool things down a bit. The most productive water was measured at 82 degrees with quite a variation in temps. Jack Duval, from Houston, might be up for some kind of Angler of the Year Iron Man award. Duval fished on his own boat out of Leonero for seven straight days focusing on billfish only. He boated (and tagged and released) 21 striped marlin, one sailfish and one blue marlin estimated to be in excess of 500 pounds. Jack worked the area about 10 miles off Cabo Pulmo all week. Billfish – Mr. Duval was not the only one catching billfish. Other anglers cashed in on the local billfish blitz, primarily boating stripers. Dorado – This was the week of the Dorado Shoot Out. The biggest fish was a bruiser of 61.4 pounds; followed by 57.3 and 52.5 pounds. 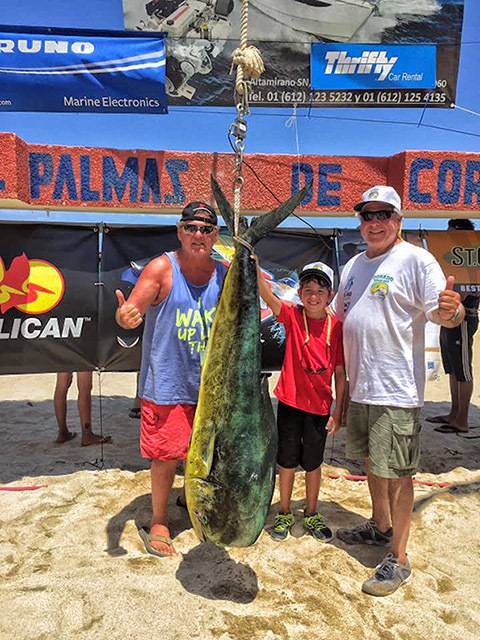 Winners were caught off Cabo Pulmo and between Punta Colorado and the lighthouse. Roosterfish – The huge roosterfish bite continues to challenge anglers. Take a look at the fish photos at www.rancholeonero.com. Those are some real hogs in the 80-pound range! Tuna – Anglers aiming for meat were able to fill their coolers with smaller tuna all week. Fish are being picked off on the troll between the lighthouse and Pulmo. Hoochies and Cedar Plugs did the trick. Some bigger tuna were also snagged while slow trolling for roosters. Always expect the unexpected around the lighthouse! As for filling coolers and freezers, good-sized snapper were taken on the reefs including the odd monster dog tooth. Fly fishers had numerous great opportunities on the good-sized roosters patrolling the beaches. Unless you want to kiss your line and backing adios, use a 12-weight outfit for these roosters … pick your spot and take a shot. .